Chief Justice Hayut, who headed the three-justice panel hearing the case, hinted then that the court would consider the MKs’ petition, filed six months ago and not heard to date, as theoretical. Today, the petition was indeed dismissed for these reasons. As the petition also attacks the constitutionality of the very bylaws used to disqualify the bill, there is no justification for the court’s decision to consider the petition as purely theoretical in nature, in Adalah’s view. 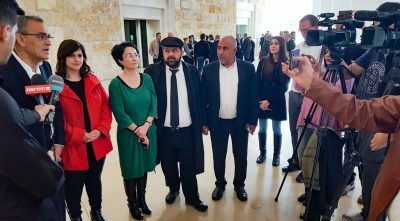 The court today chose to uphold the Knesset Presidium’s decision to prevent its own Palestinian Arab minority members from initiating a bill and a debate to promote democratic values on the basis of equality for all. “This decision violates the basic right to full equality for Palestinian Arab citizens of the state. This judgment is the second in six years that the Israeli Supreme Court has decided to uphold the Knesset Presidium’s authority to prevent Arab MKs from submitting bills and initiating debate that challenges Israel’s character as a state of the Jewish people only. In both of these cases, the court exploited the announcement of early elections as a justification to dismiss these cases. Adalah’s General Director Hassan Jabareen and Adalah Attorney Fady Khoury represented the Arab MKs in this case.